The current object-detection demo that we have built can, with an attached probability, locate and outline pedestrians in an image. Recently, the extraction of the pedestrians into separate images has also been added to the demo, and while performing ad-hoc testing, a search for the best and worst test-images has been underway. I believe that the iconic Beatles Abbey Road album cover may very-well be the number-one example we’ve come across so far! 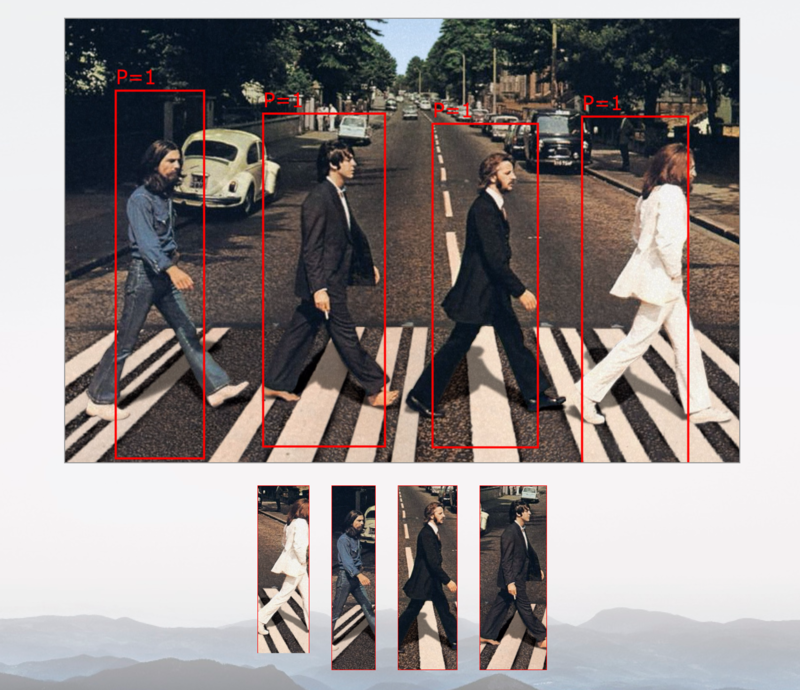 While the extraction of individuals from an image provides possibly the second-most obvious use-case for this system (after vanilla detection), the most interesting implication for me is that it is now possible to perform neural-network composition via API. Each extracted individual can now be fed into any secondary network – Classifying, or performing further extraction and predictions based on the now-restricted context of the sub-image. I see this as a developer expressing the same pipeline, and via configuration, being able to witness it manifest as various UI components on a website or mobile application… Or having it pushed to the cloud as various micro-services connected to queues… Or integrated into a single network by concatenating the layers… Or finally, using this composed network in a training-context, supplying new data and optimising the entire pipeline end-to-end. Analogously, this could be the difference between a toolbox, a welded construction, a cast engine and a grafted, living tree. What imagery would you use to describe these different manifestations?